Do you have trouble getting your kids to eat enough fruits and veggies? I think it’s something many parents struggle with. I know we go through phases with our girls. Some weeks they’re all about their fruits and veggies, the next week you’d think I was trying to torture them by serving them vegetables at dinner. Copy-Kids is a DVD designed to get young children excited about eating fruits and vegetables. It shows kids having a great time eating their fruits and veggies. Kids like to mimic the behavior of other kids, so when they see the children on Copy-Kids having fun, they want to have fun too! The first time we watched the DVD, I was surprised that both girls asked if we could go buy some of the things they saw. The DVD takes a positive approach in the venture of getting your children to eat healthy from the start. It’s divided into 12 chapters that run 6-8 minutes. Each chapter focuses on a different fruit or vegetable. I wish we had gotten this DVD when Zoë was a bit younger, because it didn’t hold her attention as long as it held Kaylee’s. Overall, I think the approach Copy-Kids takes is unique and fresh, and I recommend it to parents looking to encourage their children to add more fruits and veggies to their diet. Be sure to check out the Copy-Kids website, like their Facebook page and follow them on Twitter. Well thank you for providing these information here.. I just hope a lot of parents would get a copy for their own so kids would love this.. I had one trick with my daughter…I bought to her everything possible with pictures of fruits and vegetables…pen, printed towels, posters, sheets and then she was asking me for fruits like that: Mum, will you give me a fruit like that and was showing me different things of her. If it promotes good eating habits I am all for it. I think it’s a little soon to be worried about what my child will or won’t eat. Right now, she’s on a strict breastmilk diet. I do have one question though? Why are there no greens on this DVD? Where’s the spinach, the green beans… the asparagus? No one in this house likes broccoli, including her daddy, and if I’m the only one eating it, it’s not getting bought. You guys needed to put a little more thought into your veggie list. This is such a good idea! My grandson loves to copy others and this would help him eat more variety! This dvd looks cool and I have heard a lot of good things about it. We need dvds that teach kids healthier things! Thanks! I wish my 7 year old could watch this! My daughter is a picky eater except when around other kids–this is great alternative! Thanks for posting. need to start off with healthy eating—parents need good ideas! I would agree with the poster who mentioned the greens. Seems they should have more variety, or even just one chapter on all greens. Greens are super easy to slip in to smoothies with kids. My kiddos drink berry smoothies with spinach or kale mixed in. Also, try purees mixed in to your regular dishes. Our son is good in the veggie and fruit dept. I need a dvd to encourage our son to eat more meat and “new items” – such a picky eater. I would like to have this to try with my two year old. She doesnt want to eat a thing, and she is soo tiny. Hoping something will work for her. 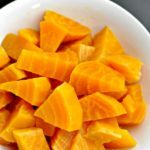 This would be great to get dd to try some new veggies and fruits! She eats them now but only certain ones and most of the time refuses to even try anything new! This might work on my younger son. Both sons love many fruits and veggies. We actually have this DVD and LOVE it. It really worked for our 4 year old. She is now eating and loving tomatoes! She didn’t like them at all before this DVD. I love this idea! It could really help me out. I think this is a fabulous idea. Would love to try it out.